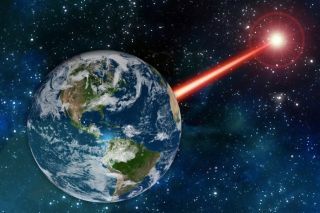 Laser technology on Earth could be used to emit a beacon strong enough to attract attention from as far as 20,000 light-years away, a new study suggests. If any intelligent aliens share our cosmic neighborhood, we may be able to get their attention using a powerful laser beacon. A 1- or 2-megawatt laser beamed through a 100- to 150-foot-wide (30 to 45 meters) telescope here on Earth could create a signal detectable by alien astronomers up to 20,000 light-years away, a new study suggests. "The kinds of lasers and telescopes that are being built today can produce a detectable signal, so that an astronomer could take one look at our star and immediately see something unusual about its spectrum," Clark added. For example, three different telescopes in the roughly required size range are scheduled to come online in the early to mid-2020s — the Giant Magellan Telescope, the European Extremely Large Telescope and the Thirty Meter Telescope (TMT). The first two scopes are being built in the Chilean Andes, whereas TMT will observe the heavens from the Hawaiian peak Mauna Kea. And the U.S. Air Force worked to develop a megawatt-class laser for the now-defunct Airborne Laser project, which was designed to knock out missiles midflight. The alien-hailing laser envisioned by Clark and study co-author Kerri Cahoy, an associate professor at MIT, would beam infrared radiation: long-wavelength light that's invisible to the human eye. The resulting infrared signal would be powerful and distinct enough that the sun's heat signature wouldn't drown it out, the researchers determined. "I don't know if intelligent creatures around the sun would be their first guess, but it would certainly attract further attention," Clark said, referring to putative alien astronomers who pick up the signal. So it might be wise to set up the system off our planet, if possible. "If you wanted to build this thing on the far side of the moon where no one's living or orbiting much, then that could be a safer place for it," Clark said. "In general, this was a feasibility study. Whether or not this is a good idea, that's a discussion for future work." Powerful lasers could also eventually help us — or our tiny robotic emissaries, anyway — journey to the home worlds of our putative alien neighbors. For example, the Breakthrough Starshot project aims to use a huge laser array to accelerate tiny, sail-equipped nanoprobes toward exoplanetary systems en masse, at 20 percent the speed of light. If everything goes according to plan, the first fleet of these robotic explorers could launch toward the nearby exoplanet Proxima b within the next 25 years or so, project representatives have said. The new study was published online Monday (Nov. 5) in The Astrophysical Journal.